Stage III Concepts was the first audio cable company to use "floating" ribbon conductors for power applications, giving us nearly 20 years to experiment, test and perfect our exclusive and highly effective signal/current transmission technology. This invaluable experience recently culminated in the critically acclaimed A.S.P. KRAKEN power cable. The exceptional performance of the A.S.P. KRAKEN is literally multiplied in this new unique 3-in-1 design. The A.S.P. LEVIATHAN's conductor array is like no other in the industry, consisting of 3 wholly independent multi-conductor cables, capable of handling an incredible 80 amps of clean, unrestricted current. As its name implies, truly a monster in appearance and performance. Extreme mechanical damping in conjunction with impenetrable layers of proprietary shielding and conductor geometry completely eliminate the possibility of any induced microphonics from vibrations or airborne electromagnetic interferences. Among its many sonic attributes (especially when used with amplifiers) expect to hear a perfect noise floor, smoothness and a relaxed authority that eliminates any compression or strain audible with most other, more restrictive power cable designs. No high-end amplifier on the planet, regardless of size or power requirements, will be impaired or even present a challenge to the A.S.P. LEVIATHAN. 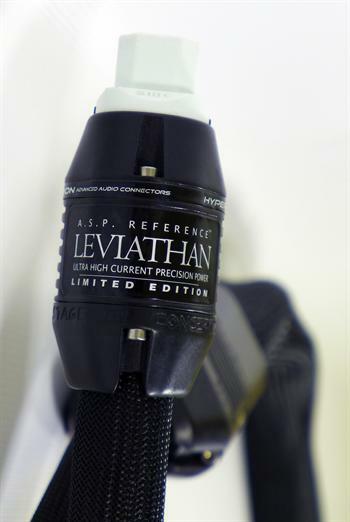 LEVIATHAN is simply not comparable to any other audio power cables on the market, a totally new category has emerged, a new brass ring of flawless performance that all others will strive for and attempt to emulate. 100% hand made with 100% proprietary elements, and absolutely no commercially produced or "off-the-shelf" components. The ultimate achievement in statement-level audio power delivery. A.S.P. LEVIATHAN power cables employ 4x3 heavy-gauge Cryo-treated, custom slow-extruded silver/palladium AeroStrandUltra™ ribbon conductors. Air dielectric with FEP Teflon air-tubes. Multi-layer shield with H.D.A. 100% radiation invulnerable foil. Geometry consisting of 3 individually damped and shielded cables in a twisted helix configuration. Each conductor + 3 heavy gauge plated silver ground wires individually shielded with silver plated braid. Multi-layer construction with soft-polymer tubing + silica/ceramic/ferrite mechanical damping/shielding layer. Custom, hand made proprietary polymer/fiber plug + cable housings.